Ms. Allred is a founding partner of the law firm of Allred, Maroko & Goldberg (AM&G). Her firm handles more women’s rights cases than any other private law firm in the nation and has won hundreds of millions of dollars for victims. 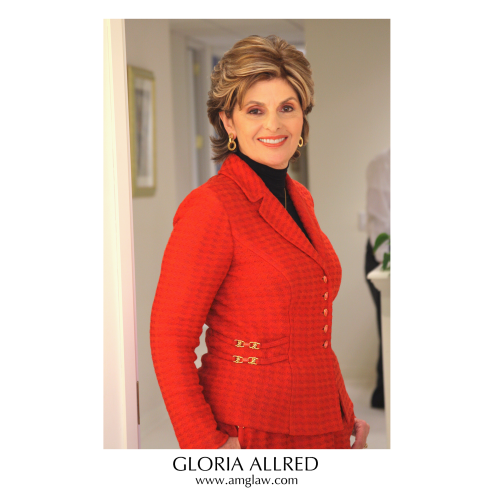 Over the course of her 42 year legal career, Gloria Allred has won countless honors for her pioneering legal work on behalf of women’s rights and rights for minorities. Gloria is a three-time Emmy nominee for her commentaries on KABC television in Los Angeles. Her nationally syndicated television show “We the People, with Gloria Allred” was also nominated in 2012 for a Daytime Emmy Award. In January 2014 Gloria received the Lifetime Achievement Award from The National Trial Lawyers for her trailblazing and pioneering role in combating injustices and winning new rights especially for women and minorities. She was honored at the 2016 International Women’s Forum (IWF) World Leadership Conference with the 2016 IWF Women Who Make a Difference Award. President Obama has introduced Ms. Allred as “one of the best attorneys in the country”. In 2017 Netflix announced “Seeing Allred” an original documentary about Ms. Allred and her battles for justice which launched globally on Netflix in February 2018 after its world premiere in the U.S. Documentary Competition at the 2018 Sundance Film Festival. In February 2018 Ms. Allred received the Lenore Kramer Award for Excellence from the Women’s Caucus of the New York State Trial Lawyers Association and in July 2018 she was given a Lifetime Achievement Award by the National Organization for Women (NOW) for her enduring commitment to fighting injustices against women. Ms. Allred is also the author of “Fight Back and Win, My Thirty-Year Fight Against Injustice- And How You Can Win Your Own Battles”.